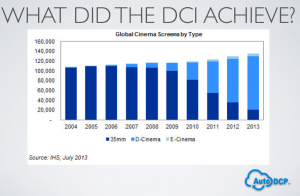 Today the worldwide industry standard for theatrical film distribution is the DCP (Digital Cinema Package). DCP’s are simply digital files which represent the entire content of a filmmakers film (including all assets such as video, and audio) delivered and encoded in a manner compliant to a standard published by the Digital Cinema Initiative (DCI). For more details about the DCI , you can visit this website: http://isdcf.com. As implied above, nearly all theaters now support it, so all you need to do is rent the theater and hire the projectionist. No more bringing in a pile of gear to support individual filmmakers, or jury rigging the projection room to support whatever you’ve done in the past. All Hollywood movies are now distributed as DCP’s. Projectionists are fully trained in the format and know how to run the systems, i.e. the format is widely supported by both local 695 and 600 as well as other similar organizations and governmental agencies worldwide. AutoDCP now offers a fully automated, fast and inexpensive way to make a DCP. This is in clear contrast to what was and continues to be an expensive option found at the major post production companies. What is it? What is a DCP? A DCP is the ‘package’ that is distributed to the theaters for playback on the theaters DCI-compliant equipment, i.e. their servers and projectors. But what is it in practical terms? Simply put, a DCP is a collection of files. A single DCP for a movie will contain multiple files, often within a folder. This collection of files (folder) will then be copied to a external HDD, or USB stick. The USB stick is what is sent to the theater, and loaded into the theater playback servers by the projectionist for playback at a later time. Here are two examples of DCP’s, one as seen in a folder on Dropbox, the other as seen from a windows machine. The name of the folder the DCP files are stored in is not important, its name can be changed at will. The files within the folder must not be altered or renamed in any way. You can have multiple DCP’s on a single HDD or USB stick, simply put them in their own folders by whatever folder name you would like. The name of the DCP is NOT the name of the folder. Rather the name of the DCP is stored as metadata within one of the XML’s inside the folder. It is the metadata name that the projectionist will see when loading it into their system, not the folder name. The projectionist will not have any ability to see folder names from their automated control systems, they can only see this metadata. A nice to thing to do when running a show, is to collect all the DCP’s from your filmmakers and then consolidate them on to a single HDD. Sending just a single drive to a the projectionist makes their life MUCH easier. Most theaters can not accept electronic delivery for a myriad of reasons, they will want a HDD not a link to a folder for them to download (it takes them too long to do so). In the case of AutoDCP, the “DCP Name” will be the folder name that the DCP is located within assuming that the filmmaker did not change the folder name when they copied it to an external USB stick or HDD. It is very important to keep track of the DCP name and the actual show name, this will help avoid confusion when talking to the projectionist. Questions to ask the theater. Here are some technical questions to ask the theater and some follow-on discussions. Is the theater DCI compliant and can they play DCP’s? Can you deliver the DCP’s to the theater on USB2 or USB3 external HDD’s, or does it only support a CRU DX115 device? NTFS, FAT32, exFat? Does the theater support mono, stereo, and or 5.1 audio? Is the draping on the screen automated so it can quickly be changed from 16×9 to 2.39 aspect ratio when showing many films back to back of differing aspect ratios? Again, what is so nice about DCP’s is you really only need to ask one question as long as they are DCI compliant, and that is question #2. The industry is currently upgrading to SMPTE DCP’s. Some theaters have yet to upgrade, so it is good to check with the theater about their status. If they do not know, you can easily use AutoDCP to generate a quick test, for free, and let the theater confirm. AutoDCP can make either SMPTE compliant DCP’s or INTEROP DCP’s, by simply making a change in your AutoDCP settings, prior to making the test DCP. DCI-compliant theaters are mandated to accept delivery of DCP’s in a special way, this does not mean it’s the only way that is must be done. Item #3 above let’s you ask what other ways you could deliver your DCP to the theater. DCI says that the HDD that is delivered can be formated as either NTFS (a windows format) or EXT2 (a linux format). Most theaters are okay with you sending a HDD which is properly formated NTFS or EXT2 which is USB or possibly even USB3. Frankly, many theaters prefer the the USB3 drives as they are MUCH faster, but double check with your theater. Most theaters are also often okay with drives which are FAT or exFAT formatted (this is often the way the drive comes from the store). Please note, most, if not all theaters, CAN NOT read Mac formatted drives. Since most of the creative industry uses Macs, this is one of the biggest problems that happens in the projection room–when editorial delivers a DCP on a mac-formatted drive. This can lead to big hassle on show night. A bit of industry fact, when a film is distributed by Hollywood to the theaters, the method is a DCP on a CRU Dx115 drive which is formatted EXT2. Thousands of these are shipped every week out of Hollywood. A CRU drive is a special military grade HDD enclosure which plugs straight into the show servers located at the theaters. They do not plug in via USB, they plug in through their own proprietary connector. You can learn more about the Dx115 drive enclosure here: https://www.cru-inc.com/products/digital-cinema/digital-cinema-dx115/. CRU also manufactures a Dx115 to USB device which allows you to easily copy files to a CRU Dx115 from your own laptop, here more details on it: https://www.cru-inc.com/products/digital-cinema/digital-cinema-movedock/. These devices are reasonably affordable. Items #4 and #5, are to help you in your own planning and to help set expectations by the filmmakers. The only real difficulty is dealing with proper draping at a theater when showing many back-to-back films which may or may not all be in the same aspect. This issue is simply brought up here as a good thing to talk about with your projectionist as to how best to address the problem, and or time needed by projectionist in order to reconfigure a screen. What to tell your filmmakers. This is the part that can frustrate many festival runners and filmmakers. What are the specs for your show? To be quite honest, many folks mess this up. Thankfully, most of us have had experience in working in production in one way or another, and we all know that the best advice is a “strong positive attitude.” This is not the place to be vague. Tell them exactly what they need to deliver including SMPTE or Interop, file or container format (such as DCP), delivery device. Here’s an example list of things to tell them (this is only an example, modify as suites your festival per notes above). Mail us a SMPTE DCP on an external USB3 enabled stick (filmmaker to provide all necessary cables, power as necessary) to the festival address attention the festival showrunner. All DCP’s must be 24fps. No exceptions. Make sure AutoDCP is configured to generate SMPTE compliant DCP as required by this film festival (again change this to suit your own festival requirements and or theater limitations). Use a QT prores 422 as source to AutoDCP, this insures a great quality DCP. If doing 5.1 audio, insure that the audio is stored in the QT as six channels in one track, not six mono tracks in six separate tracks. This is similar to how stereo content is normally stored, ie two channels in one track. Your source QT can be either 23.98 or 24fps, or telecine 60i, AutoDCP will do the proper conversion to generate a 24fps DCP. AutoDCP can convert other frames rates, however, it is sugested you do this in editorial so you know what the results will look like. A common visual mistake by filmmakers is to letterbox 2.39 or 1.85 content, ie putting a 2.39 image inside of a 1920×1080 window will result in a black bar at the top and bottom of the screen. This presents a problem at the theater, they must play the content back as 1920×1080, but mask the theater at the top and bottom of the image. This is an unnecessary burden on the theater as well as reduces the overall image quality of the filmmakers movie. Make sure to use the right resolution to match your aspect ratio. DCP’s should be test screened in a DCI compliant theater prior to delivery to this festival. It is the responsibility of the filmmaker to insure the content looks the way filmmaker intended. It is poor practice as a producer to not allow proper time to insure the quality of the content at this last most important part of the process, preparing for screenings and or distribution. We are all interested in showing the filmmakers content in the best way possible. DCP’s help insure this will happen if you take the proper steps. This festival will test screen DCP’s on a prearranged date, you must arrange to be present to QC your content and or have a proxy in place. All content not QC’d will be removed from the festival. Hope this has given you a relatively quick outline of what to be thinking about when running a film festival which is moving to DCP. Feel free to drop us a line anytime, we are always willing to help.